Mendip Plains Equestrian Centre is run by the Green family, who have been farming on the Waldegrave Estate in Chewton Mendip and Ston Easton for over 80 years. We owe the Waldegraves a huge vote of thanks for allowing us the opportunity to diversify into the equestrian sector. Our aim is to provide a friendly face and a facility for all ages and abilities. Whether horse-riding is just a hobby to you, or you are out to produce the next Badminton winner, we hope we can help in some kind of way. A large outdoor school, 50m x 90m with a sand and fibre surface and radius corners. Available with the arena is a judges/commentary box with a timing and PA system. The arena is large enough to hold up to two 20m x 60m competition dressage arenas with a warm up area, or a full Show Jump course can be set up with a warm up area. 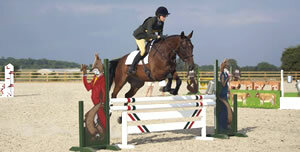 A large flat grassed area is available for schooling and events. The area is large enough to hold a 20m x 60m competition dressage arena with a warm up area, or a full Show Jump course can be set up with a warm up area. A course of ten wooden and aluminium show jumps, all fitted with FEI metal key hole tracks. These jumps are light weight enough to make moving around easy for grid work or training sessions yet still heavy enough to prevent blowing over in the wind. 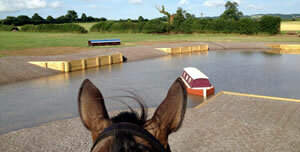 This course can be set up on grass or the all weather arena. A set of 14 bespoke show jumps built to FEI standard, for use on competition days in the all weather arena. The Cross Country Course is set in traditional Mendip Hunting Country with a variety of fences ranging from 60cm to 100cm. Among many portable fences, Mendip Plains boasts a 27m x 45m water complex, there is also a sunken road, mounds, steps and ditches. The course has been designed by FEI International Course Designer Eric Winter and built by Willis Bros, Cross Country Builders of Badminton, Gatcombe Park, Barbury Castle and many more. 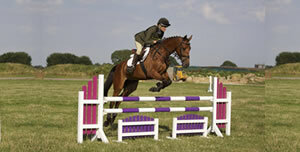 We also have a Mini Cross Country Course with fences 40-50cm at £12 per horse. Booking the Mini Course does not allow you access to the Main XC Field. If you wish to use the water jump please book the Main XC Course as usual at the 14yrs and under rate of £20, thank you. Plenty of hard standing for competition & training days. On site café providing hot food, drinks and snacks. Open on most competition days.